Kaspersky Total Security for Windows 10 - A comprehensive solution for the security of a personal computer. The program includes a number of modules for comprehensive protection of system and user data, supports parental control and protection in real time. The anti-virus has a built-in firewall with the ability to add rules and make exceptions, automatically scans the RAM, and knows how to scan files on a schedule. The program applies several principles of data analysis, is able to predict the behavior of applications and independently block suspicious activity. 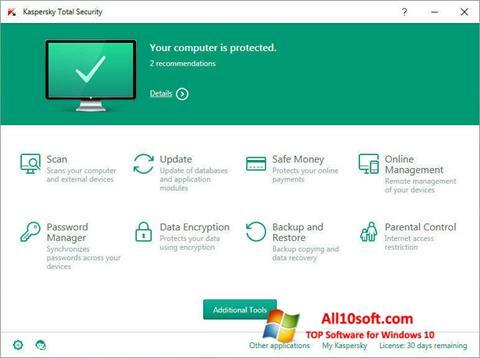 You can free download Kaspersky Total Security official latest version for Windows 10 in English. Publisher Software: AO "LABORATORIYA KASPERSKOGO"